1/19: AV refurbishment with one repeater LCD near rear room divider. 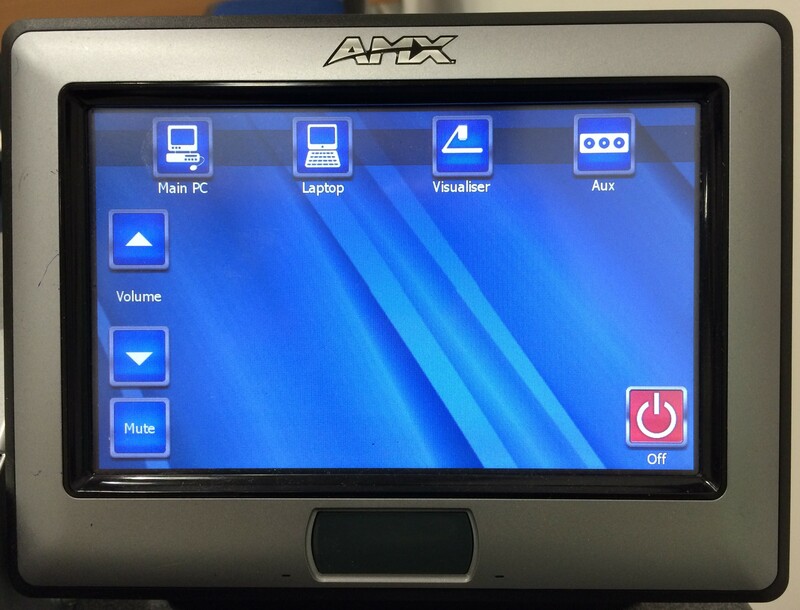 Tap the touch screen to display/select buttons for the equipment. 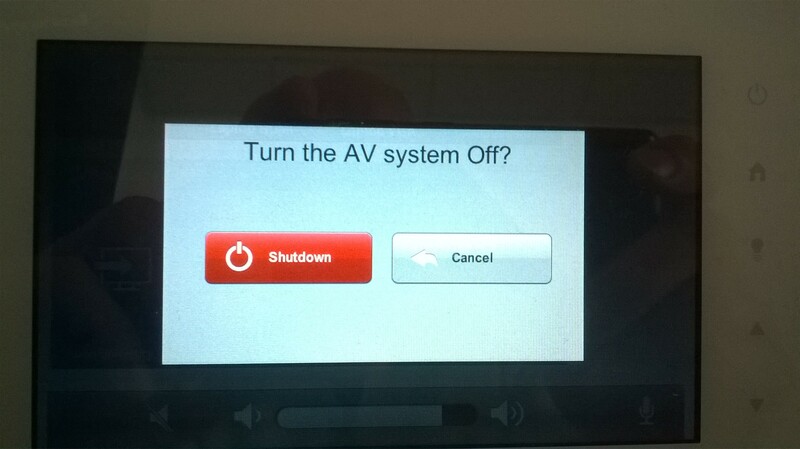 To switch off, tap Off or Exit/Shutdown, and then confirm with Shutdown Now. Newer lecture ‘Digital‘ theatres have audio ‘send’ and multiple projectors and lectern monitor selectable for each input source, and separate mic(red \ ) and speaker(white \ ) mutes. Some also have sub-menu/s for additional facilities like Camera, Lighting and Blinds controls. Wireless presentation that uses our internal WiFi network to present photos, PDF, and Microsoft Office files etc. on the room display/s from your wireless devices. 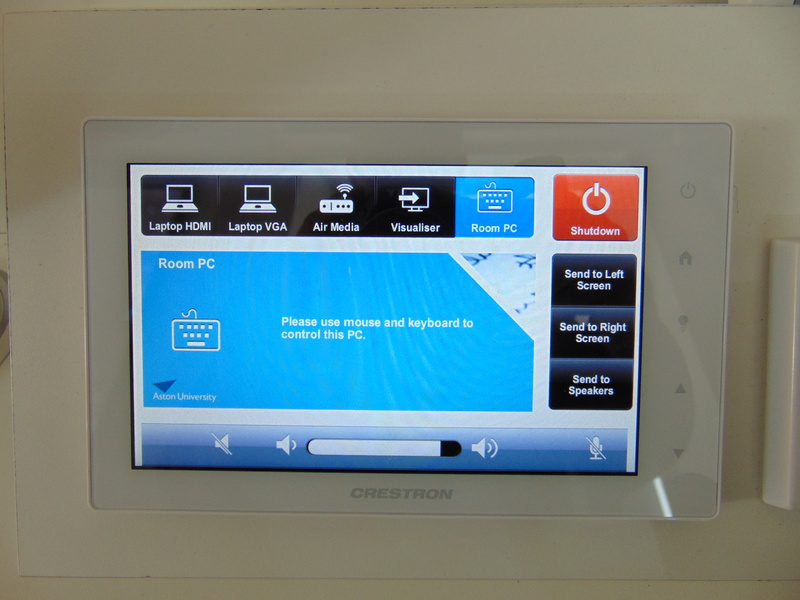 Crestron AirMEDIA: iOS/Android device and/or your Windows/OS X laptops. When AirMEDIA or VIA ConnectPro is selected, it displays the Room address and a unique [code] to present the content on the screen/s. You can have up to four WiFi devices concurrently displayed in each corner of the picture. AirMedia AM-100: G11, Gt.Hall, MB518(n/c! ), MB603, MB653, MB708b, Adrian Cadbury, SusanCadbury, NW805, NW807. Kramer VIA Connect/VIA ConnectPro: ABS6.4/5, ABS2.10(L4), G45(Council Rm), MB304, MB504, SLT(MB651) and 2018/19 refurbs. Kramer VIA Campus: SW309, VSG03. You can book a mobile AirMedia for most rooms with wifi (and a demonstration) from AV-Support provided there is enough notice to setup and to configure it. A flying HDMI cable (including audio) is usually* connected to the lectern faceplate. Note All post-2014 refurbished rooms now support HDMI(digital) inputs as well as VGA, namely: G11(Byng Kendrick LT), Great Hall, MB220, MB253, MB304, MB415, 417, 419, MB486, MB504, MB518, MB603, MB651(Sumpner LT), MB653(Wright LT), MB657(Proj.Room), MB708b, NW104b, NW805, NW807, NX02, Adrian Cadbury and Susan Cadbury LTs, and VSG03, VS110, VS112. Some laptops and tablets may require a special AV adapter and or cable/s. *except NW104b and any ‘non-pool’ meeting rooms. A flying VGA cable (with integrated audio jack connection) is usually connected to the lectern faceplate. The laptop audio jack can also be used for iPod playback when laptop is selected. Note Some laptops and tablets require a special adapter from the laptop to the VGA connection. To switch on/off, push the button at the base of the flexible gooseneck. The LED will be lit when the microphone is on, and the level is preset. There is no switch or LED on the white Beyer flat models. Rechargeable microphone/s which automatically unmute/mute when removed from/replaced correctly in the charger. There are a maximum of two mics/channels per room, ~20m range, and freedom to interact with the audience while recording to Replay. Please replace the microphones on the charger when they are not in use, and check the LED. The LED on the microphone will turn RED to show they are charging, and GREEN when fully charged. Lift the Arm to turn ON. Zoom control is on top of the Arm. 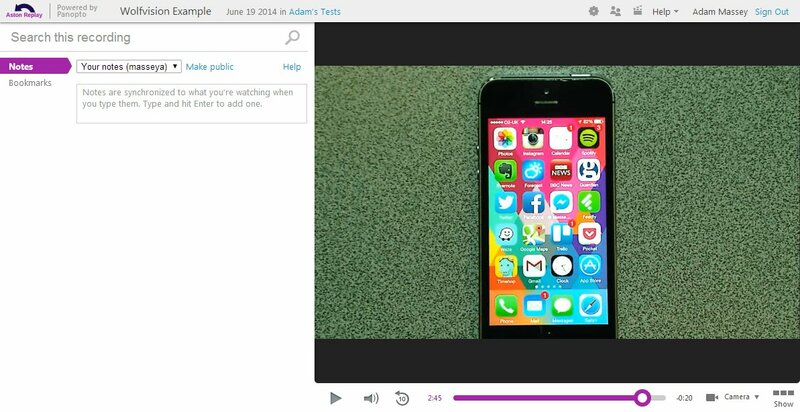 The method of recording the contents of this visualiser in Aston Replay is different to the other rooms. Expand the instructions, below, for more information. 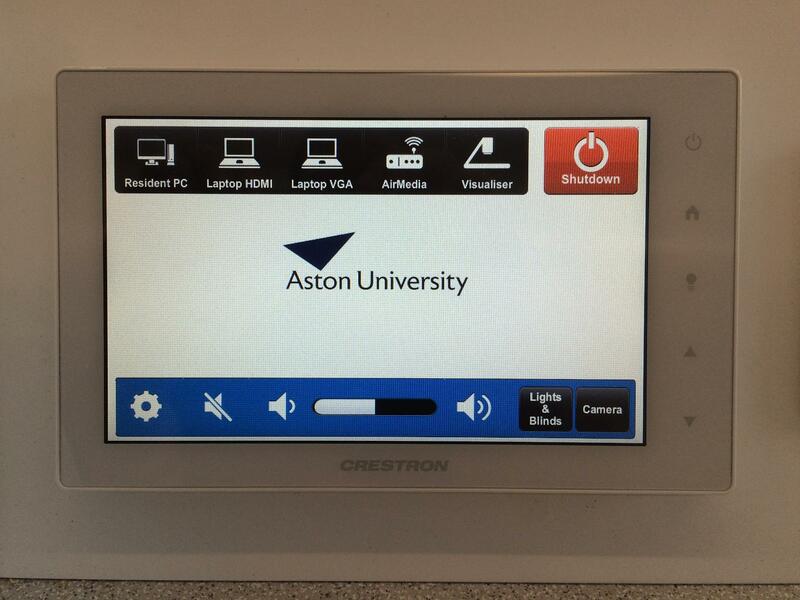 Unlike the other visualisers in use in Aston University learning spaces, the Wolfvision acts in the same way as a webcam or another camera. This means we can record it directly in Panopto. This starts recording the camera in the visualiser. When you want to stop using the visualiser, remove it as a secondary source by going back to the Panopto recorder and clicking on the X next to it. When you stop using the visualiser, any viewers of the recorded session will continue seeing the content of the visualiser. If you begin presenting using Powerpoint again, your viewers will have to manually switch back to the Powerpoint source themselves. At the point in the recording when you clicked the X to remove the secondary source, it will switch back eg to PowerPoint or the screen capture. You can repeat the above steps as many times as you need during a lecture.